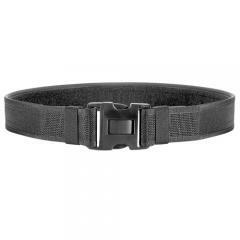 The Bianchi PatrolTek 8100 is a tough duty belt for law enforcement officers. It is made from durable, double-layered two inch wide nylon webbing, making it extremely strong and wear resistant. Its loop lining attaches easily to your liner belt, allowing you to use it as part of a complete duty belt system. Smooth edge binding makes the belt more comfortable to wear, preventing it from cutting in. It fastens using a heavy-duty Tri-Release shatter-resistant polymer buckle. Its three-point release mechanism resists accidental opening, providing more security than a traditional side-release buckle. Please note that these belts are over sized by two inches to accommodate a liner belt and padding. This belt is awesome and durable.